Olive oil and lemon are used individually as health and beauty remedies and, in combination, for a variety of conditions and health complaints. Olive oil is a natural oil derived from the olive fruit. Because extra virgin olive oil only requires minimal treatment and handling during the extraction process, nutrients are preserved, and the pure oil is rich in minerals and vitamins. Lemons are vitamin C-rich and provide vitamin B, proteins, potassium, carbohydrates and phosphorous. Lemons also contain flavonoids, which have antioxidant qualities, according to Dr. Madhukar Patil, Ph.D., of Organic Facts. The cholesterol-lowering effects of olive oil are greatest if you choose extra-virgin olive oil, which is less processed and contains more antioxidants than other olive oils. Olive oil contains monounsaturated fatty acids, which are healthier dietary fats than saturated and trans fats. Monounsaturated and polyunsaturated fats may lower your total cholesterol and your bad LDL cholesterol levels. Olive oil also helps maintain good HDL cholesterol levels and may reduce your risk for heart disease. Lemon can lower blood pressure and increase good HDL cholesterol, levels, according to the 2010 article, "25 Health Benefits of Lemons" by LiJingMing. Extra virgin olive oil contains heart-healthy antioxidants, such as tocopherols, the natural form of vitamin E. These antioxidants may help reduce the risk of heart disease by protecting your body from the oxidation of cholesterol, which can clog your bloodstream and lead to hardening of the arteries according to Richard Ash, M.D., of The Ash Center. Olive oil contains powerful heart-disease-fighting anticoagulants that thin the blood and reduce the chances of blood clots and blood vessel blockages. Lemon juice contain potassium, and drinking it can be helpful for people who have heart problems or high blood pressure. Fresh lemon juice has antibacterial and antimicrobial qualities. It is used in treating various stomach problems including stomachache, indigestion, acid stomach and cramps. The carminative effects of lemon can sooth your digestive tract and help reduce gas and bloating. Mixing and drinking one spoonful each of olive oil and lemon juice before a meal may help protect your stomach from ulcers and relieve constipation without aggravating your intestinal tract. Consuming olive oil may discourage the growth of gallstones. Drinking a mixture of lemon, olive oil and water an hour before eating breakfast can flush and help detoxify your gallbladder, liver and kidneys. To strengthen weak, brittle, breaking or chipped nails, try mixing 1 tbsp. of heated extra virgin olive oil lemon juice with 1 tbsp. of lemon juice in which to soak your nails for 10 minutes before you go to bed. You can also sleep in thin cotton gloves to allow the lemon and olive oil olive oil mixture to penetrate your nails overnight. Lemon oil may help make your hair healthy, strong and shiny, and it can help control dandruff. The lemon's antiseptic and astringent qualities may help treat skin disorders. Mix and drink 1 tbsp. 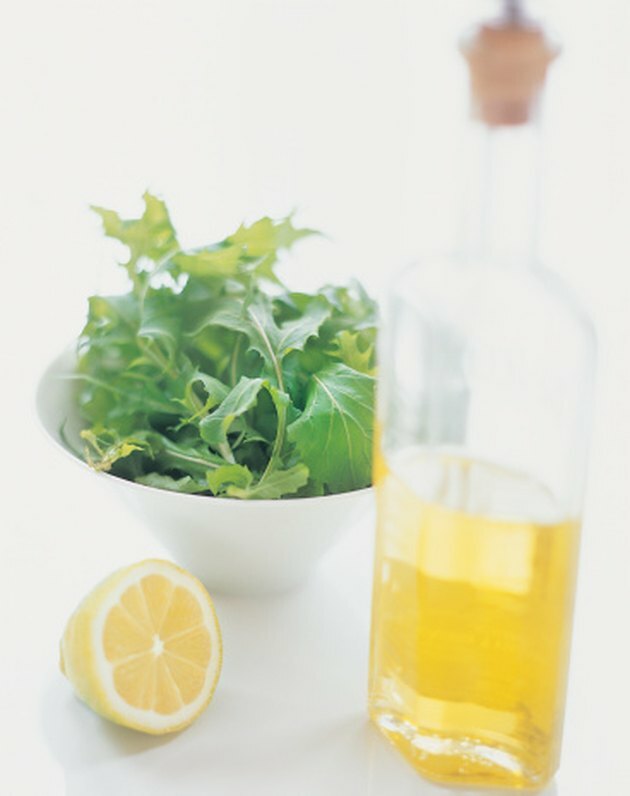 of olive oil with fresh-squeezed lemon juice to help maintain a healthy body, lustrous hair and smooth skin. Organic Facts; Health Benefits of Lemon; Dr. Madhukar Patil, Ph.D.
MayoClinic.com; Olive oil - What are the health benefits? ; Donald Hensrud, M.D. The Ash Center; Heart Disease &amp; Alternative Therapies; Richard N. Ash, M.D.